My favorite EDC/travel/office backpack of all time is now bigger and better than ever. Alpha One Niner is now offering the EVADE 2.0 which boasts several new features and some additional internal volume over the original EVADE. There are a ton of new features and I highly suggest you watch the video below to see them all. The highlights include new modular components like a beavertail, hip belt, hook backed admin organizers. The packs also has a deeper main compartment and a new integrated luggage handle pass-through. The new flatter shoulder straps and compression straps are also an improvement over the original. The EVADE 2.0 is available in a number of color and fabric options. Your choice of two admin organizers is included. Check out the EVADE 2.0 at AlphaOneNiner.com. Way back in 2013, I started using a backpack called the Penumbra from SERT. It was the best EDC/office/travel backpack I had used up until that point and it continues to serve me well. 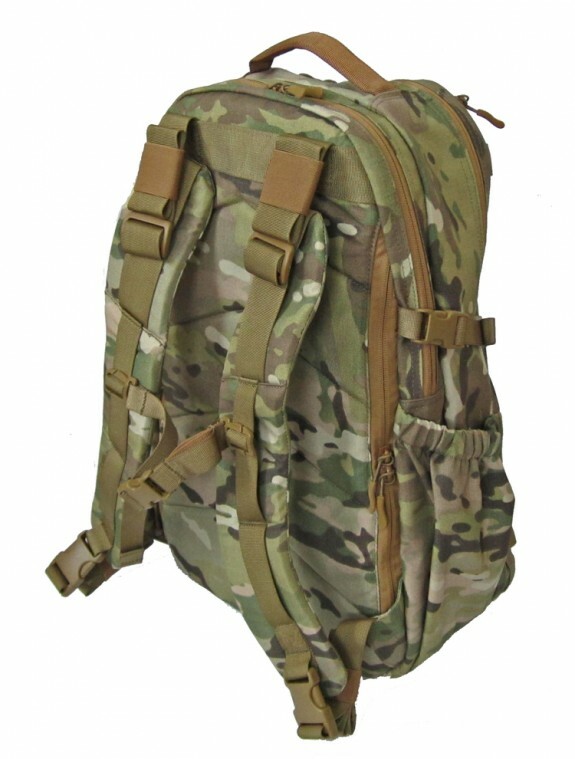 I moved to the Alpha One Niner (SERT’s decidely less tactical sister company) EVADE pack in 2015. I still use the EVADE daily. You could say I have a long history with the travel/EDC of SERT and Alpha One Niner and that history is about to have a new chapter with the introduction of the RECON THREE. I have been using this as an EDC pack and for travel. It was with me on a recent trip where I spent far more time in airports than I did at any one location. It has been carried in rain, stuffed in overhead compartments, hauled through airports, and generally tossed around. Now its time to take a closer look. The RECON THREE is a designed as a kind of minimalist travel backpack. 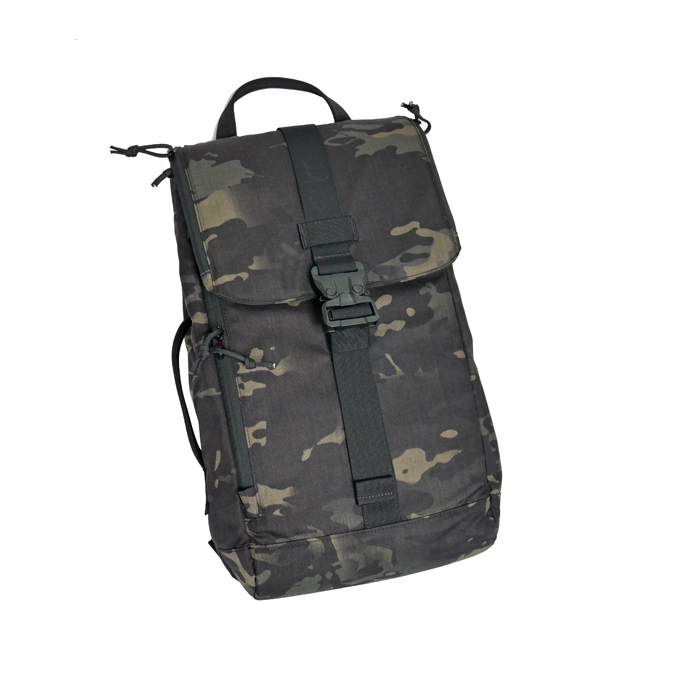 It blends sleek urban styling with rugged tactical materials. While previous packs from SERT or Alpha One Niner have been heavy on organization features, the RECON THREE goes heavy on big empty pockets and accessibility. There are no pen sleeves, mesh pockets, bottle holders, or anything like that. In the place of all that are 5 very accessible pockets in key locations and a cavernous, bucket like main compartment. Materials: Solid Color 500D Nylon in Wolf Gray, Multicam Black, Kryptek Typhon and 420D Diamond Ripstop Nylon with 210D Nylon lining. If you like to travel with a few key items at your finger tips and you are more of a tablet guy than a laptop guy, this bag was designed with you in mind. In my mind, there are two hallmarks to Alpha One Niner bags – style and durability. The RECON THREE delivers both. It is one of those designs that manages to look sleek, stylish, and not the least bit “tactical” in spite of the Multicam Black fabric and ITW Cobra Buckle closure. I think the bright red interior pack cloth lining and angular shape make it look at home in a variety of settings without screaming TACTICAL. Regarding durability, the RECON THREE seems to have it in spades. 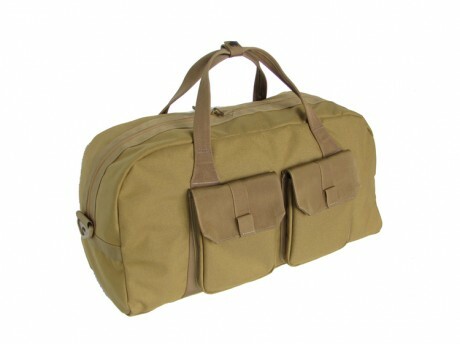 The bag in constructed from durable materials like 500D nylon and fully lined with 420D pack cloth. The zippers are all #8 reverse zippers from YKK. The main compartment is closed with an ITW Cobra Buckle and the entire pack is stiffened with closed cell foam between the outer layer of fabric and the inner lining. It’s rugged. I tend to like packs that leave the organization to me instead of having fixed organization features. 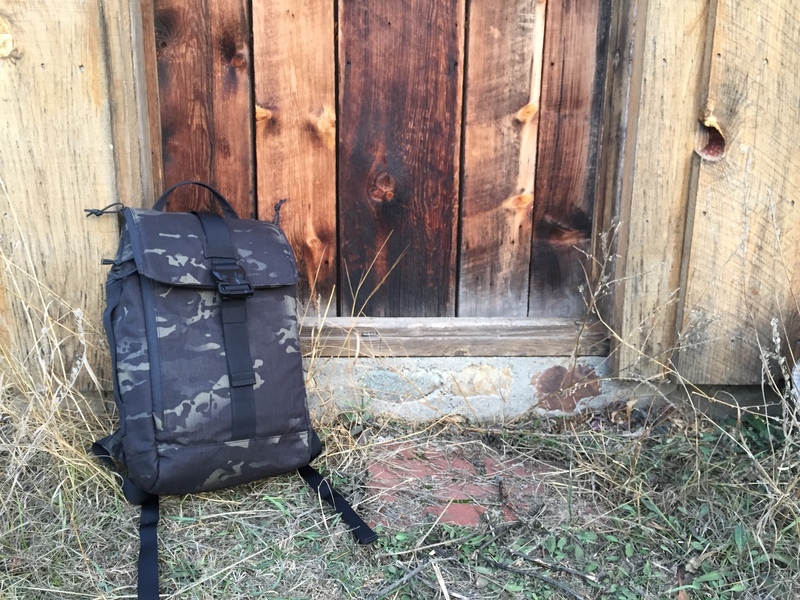 The RECON THREE is that kind of pack. There are 5 pockets in total and none of them have any features other than being a pocket and great accessibility (which is key). All 5 pockets are closed with a zipper. 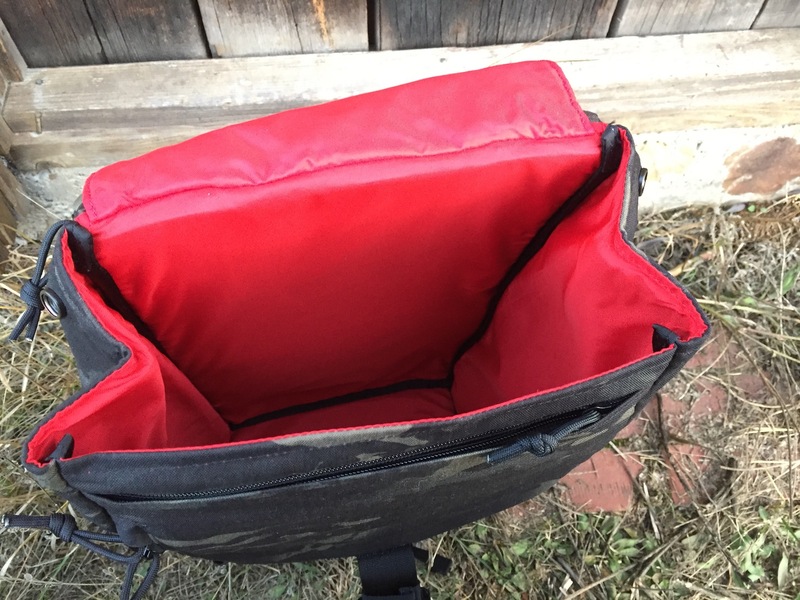 The lid features 2 pockets which can be accessed from the side of the lid. This pockets are not connected inside the lid but they do overlap each other. They basically turn the entire lid into storage space that can be accessed without opening the pack. These two pockets are perfect for things like keys, pens, cables, chargers, and similar items that you want at your finger tips when traveling. The front of the bag has a large stash packet that is accessed via a vertical zipper on the left side of the pack. This pocket is tall and as wide as the pack itself so it is perfect for documents. I like to keep a sheet of paper with all my key information on it when I travel and this externally accessible pocket was the perfect place to store something like that. When you lift the flap, it exposes the main, top loading compartment and another tall slash pocket. 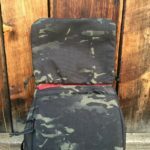 Since every panel of the bag is padded with closed cell foam, this slash pocket actually works really well for a tablet or even a 13″ notebook computer. Imagine a brown paper lunch bag and scale it up to backpack size and you will have the general idea of the main compartment. It loads from the top and has the 5th pocket hanging in side it. It is basically just a big open pocket that can easily carry a change of clothes and more. The top of the main compartment can be compressed with two large snaps. These snaps are very handy because they pinch the top of the main compartment so that the flap completely covers the opening. The shoulder straps are relatively minimalist. They are slim, straight, and padded with a relatively stiff closed cell foam which makes them surprisingly comfortable. 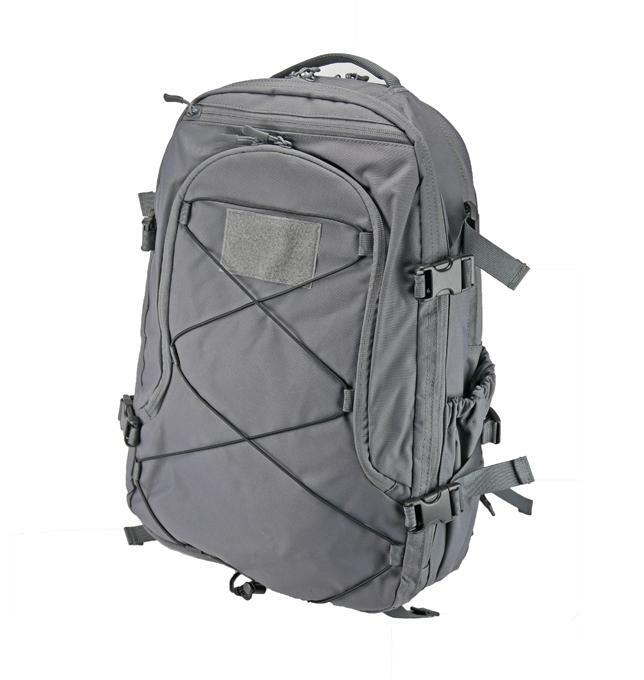 They include a sternum strap and side release buckles that you can use to get out of the straps quickly or tuck them away inside the rolling luggage sleeve on the back of the pack. When the straps are packed inside the sleeve, you can use one of the two carry handles on the bag (one top and one side) to carry the bag kind of like a briefcase. The RECON THREE holds its shape very well thanks to all the closed cell foam used in its construction. You can stuff it full and it still looks relatively rectangular and sits mostly flat on your back which is nice if you ever need to overload it. It even holds its shape when it is relatively empty. 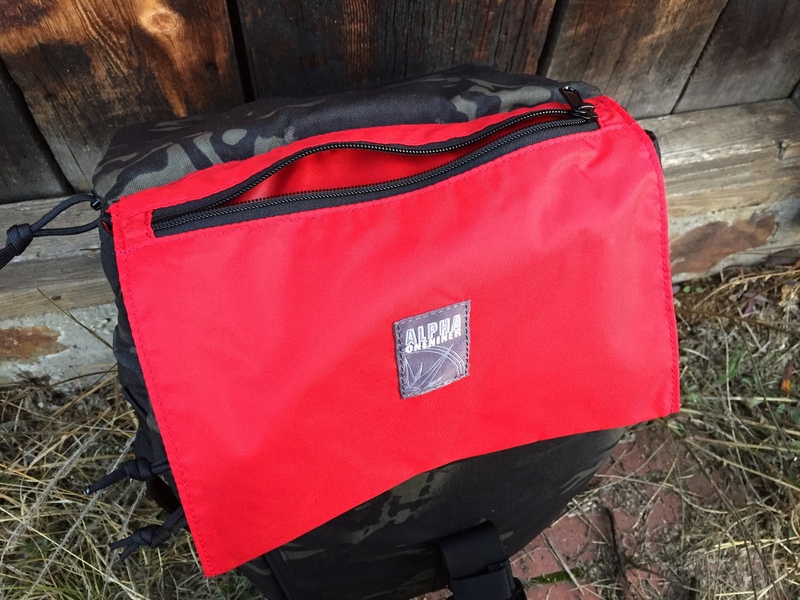 I think the best way to describe this bag is as a minimalist EDC or travel bag. If you are the type of person that uses your own organization inserts and doesn’t need to carry a larger laptop every day, you’ll like this pack. The pockets offer excellent accessibility, there are good provisions for smaller notebooks or tablets, it is well made, and it looks absolutely great in my opinion. Disclosure: This pack was sent for review, free of charge, by Alpha One Niner. 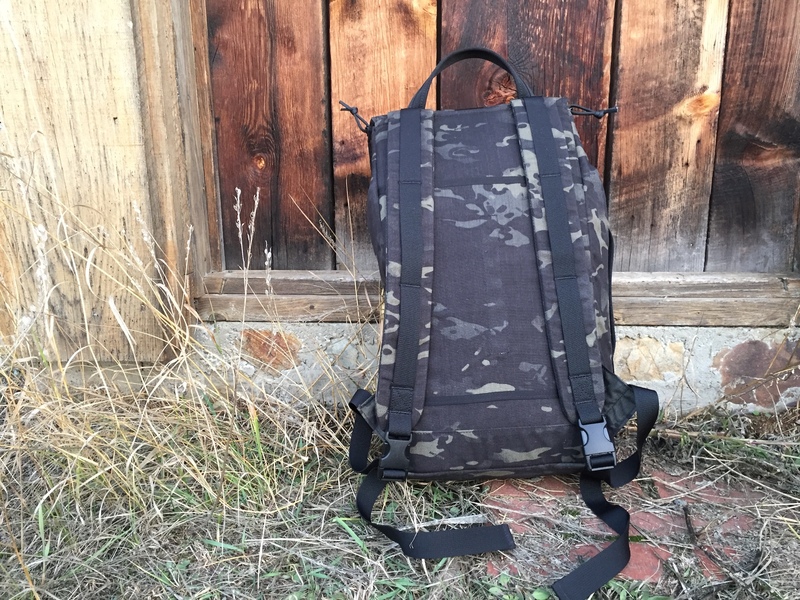 Alpha One Niner just rolled out their latest pack, a light travel or minimalist EDC pack called the Recon Three Backpack. Like everything else from Alpha One Niner, this pack has the durability and materials you would expect from a tactical pack, the style you would expect from a fashion line, and the organization features of a travel bag. 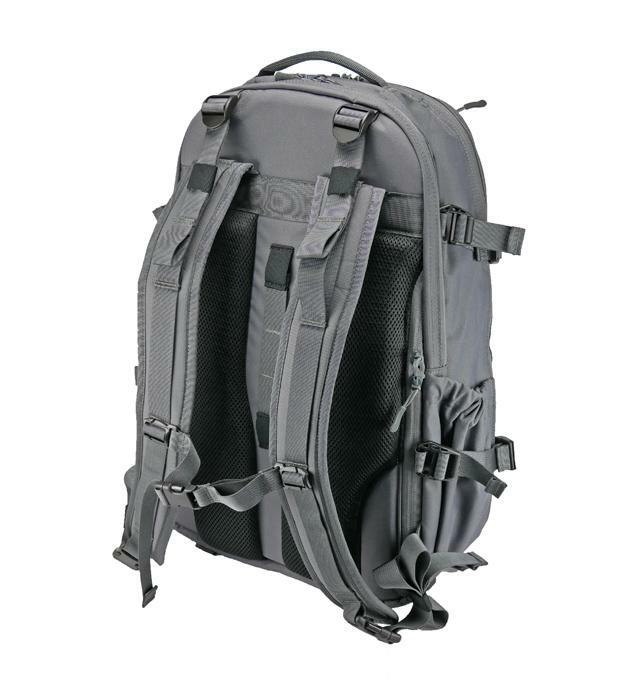 The Recon Three has a top loading, 925 cubic inch main compartment that can be slimmed down via snaps that compress the top of the bag for a close-fitting, tapered shape. The flap lid has a zippered pass through pocket and is secured via a webbing strap and ITW GT Cobra buckle. The front of the bag features a large zippered stash pocket that is accessible from the outside and a deep zippered pocket under the flap. The main compartment also features a small zippered hanging pocket for small item organization. The shoulder straps are straight in shape and padded. 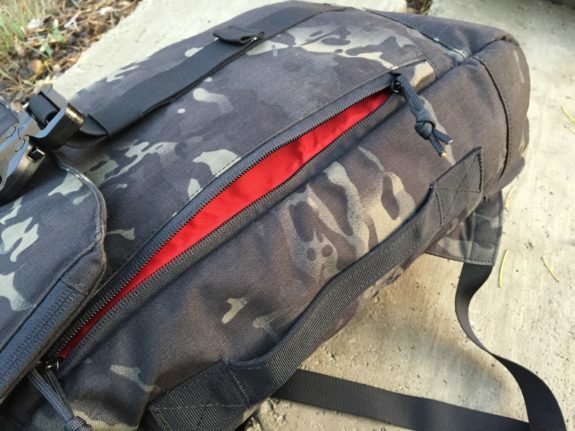 The bag has both a top and side carry handle. The back of the Recon Three features a pass through that can be used to nest on the pull handle of rolling carry-on luggage and/or to tuck in the shoulder straps. The Recon Three was not necessarily designed to carry computers and tablets but it can. The bag is padded with closed cell foam to help it keep its shape and protect the contents. The front, outside accessible stash pocket is large enough to accept a tablet and the inside front pocket can accept some 13″ notebooks computers. Four color and fabric options are available: Ripstop Black, 500D Wolf Grey, 500D Kryptek Typhon, and 500D Multicam Black. See the video below for a full walk-through of the bags features. You may remember Alpha One Niner from when they launched their first product, the RECON ONE, via Kickstarter. Since that time, the Alpha One Niner portfolio of tactical gear inspired travel and EDC goods has grown considerably. Alpha One Niner is the brainchild of Helm Ashiblie of SERT, Sneaky Bags, and other ventures. His work literally takes him around the world on a weekly basis which gives him a great perspective on what people really need in a travel bag. 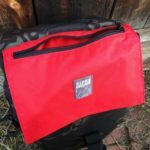 Helm previously designed the SERT Penumbra to serve as his ultimate travel backpack (I reviewed that bag on these pages and still use it daily) but this time he enlisted the help of the EDC Forums readership to help design a new bag called the EVADE Backpack. If you like the Penumbra, you’ll like the EVADE. Helm’s design influence can be seen throughout the bag. In some ways, it looks like a scaled down version of the Penumbra but to assume that would sell short the several new features that the EVADE tucks away in its nylon shell. Starting from the front of the EVADE and moving back, you first find a large loop Velcro field for patches and ID. 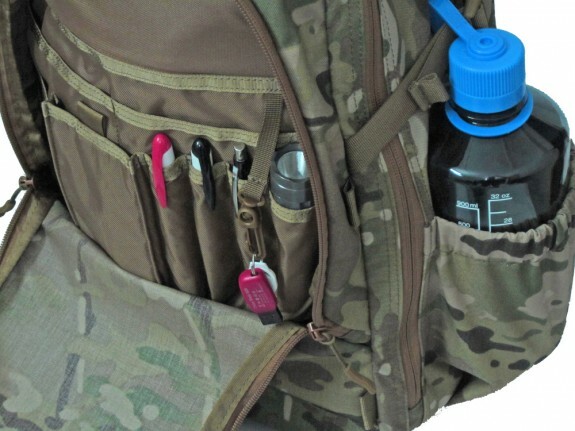 That loop field is sewn to the outside of the large admin pocket which boasts several organization features included a padded slip pocket for electronics, pen slots, a lanyard, and tons more slip pockets of various sizes. This compartment also has an attachment point for the new Matroskya Pouches which are essentially removable internal pouches that are sold separately. The next compartment moving toward the back is the main compartment. It represents most of the pack’s 1650 cubic inches of volume. 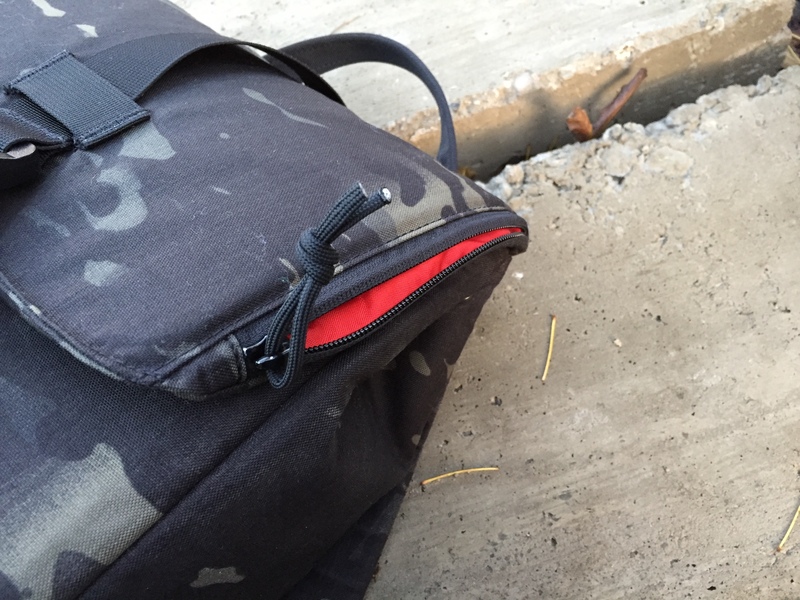 The compartment is designed to open very wide and is secured with a zipper and two side mounted compression straps. 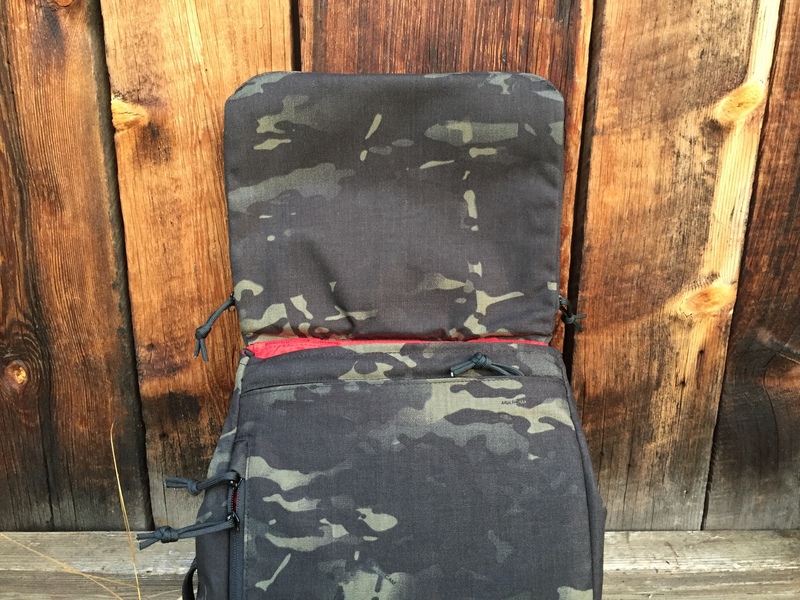 It features two internal mesh pockets which is a common element of Helm’s designs and another mounting point that will accept a large Matroskya Pouch. 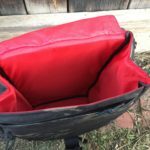 The Matroskya Pouch mounts at the top of the compartment allowing you to essentially segment the main compartment and simply flip the Matroskya Pouch out of the way to access your other gear. Moving back from the main compartment you find an elastic slip pocket on each side and a generous laptop compartment. The slip pockets are perfect for water bottles or similar gear. The laptop compartment is padded and will accept up to a 17″ laptop or tablet. Hidden behind the EVADE’s padded back panel is a loop Velcro lined, zipper closed concealment pocket. 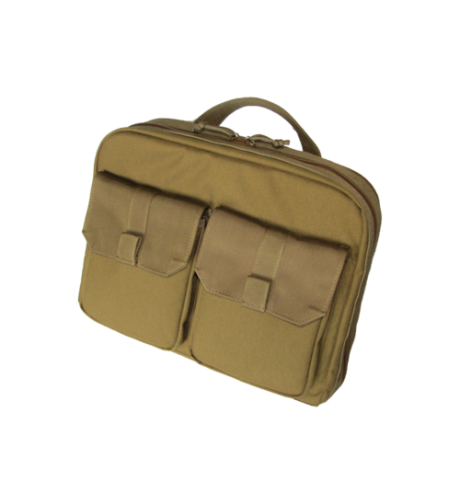 This can be used for carrying a handgun in a Velcro backed holster or as a place to store documents or a tablet. The EVADE also has nicely padded shoulder straps and a padded grab handle. There are webbing loops that can be strung with shock-cord to create a bungee storage matrix on the front of the pack. 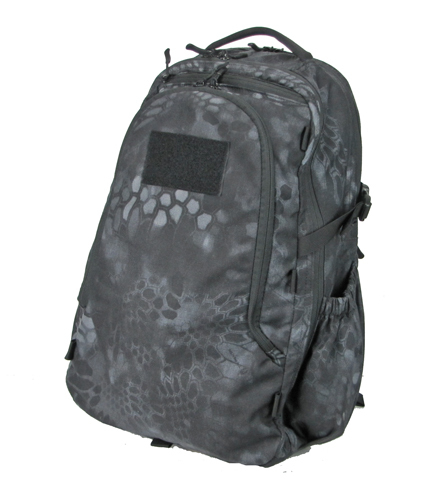 The EVADE Backpack is available in a number of color and fabric options. 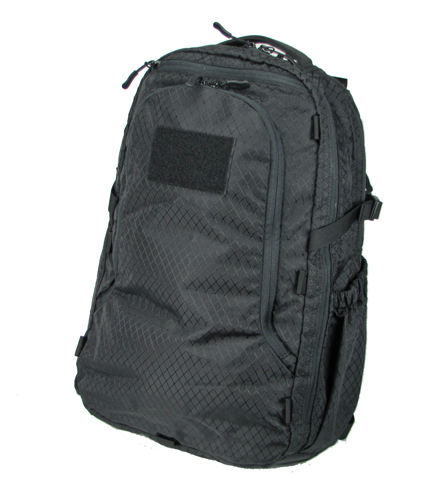 You can check out the EVADE Backpack at Alpha One Niner. If you “Like” Alpha One Niner on Facebook, they will provide you with a 20% coupon code that will save you some cash on your own EVADE Backpack. You may remember the really slick RECON ONE Tablet Caddy & Bag Kickstarter Campaign that we mentioned several months ago. That bag and campaign has now launched an entire brand. Alpha One Niner is the brainchild of Helm Ashiblie of SERT USA and other ventures. He certainly knows how to make quality gear. Alpha One Niner is more of a life style brand than his other brands. Their bags aren’t not “tactical” bags but you can certainly see the influence of the tactical arena in their design and materials. They have a number of bags and pouches available at their initial launch including the RECON ONE which has some of the coolest, tablet-centrique design features you will find in a bag. Check out AlphaOneNiner.com.